Chicago police announced Thursday that following an investigation, they no longer believe that a DePaul student was kidnapped and robbed near the Lincoln Park campus. According to the Public Safety alert released by the university, the 19-year- old student had claimed that on Jan. 8 he was walking through the alley behind the McDonald’s located at Fullerton and Halsted around 8 p.m. when two men and a woman approached him with a gun. The student claimed that he was forced into a car and driven to an abandoned house before being robbed, then he was released. Public Safety was alerted of the report and sent out the alert early on Jan. 9, however the Chicago Police Department took over the investigation. After conducting an investigation, a CPD spokesperson announced that police no longer believe that the kidnapping and robbery had actually taken place. Guglielmi’s tweet ends by saying that it was not a “random incident,” though it has not been made clear as to whether or not the student was robbed. Public Safety released another alert to tell students that the kidnapping and robbery had been fabricated. Following the alert, students took to social media to comment on false report, some making jokes about the incident with others expressing their disapproval. “Why does anyone find the need to lie in a situation like this [and] find any excuse to make up a story so it’s sent to everyone on campus?” said freshman Jorge Iniguez. The false report follows a rocky fall quarter for Public Safety, in which a number of robberies and assaults occurred on and near both DePaul’s Lincoln Park and Loop campuses. A number of alerts were posted around the campuses and sent electronically to students, keeping the university on high alert. Public Safety officials said that while infrequent, false reports have been made by DePaul students in the past. Currently the investigation is still ongoing, so police have not charged the student with filing a false report. However, the police department may decide to charge the student depending on how the rest of the investigation goes. 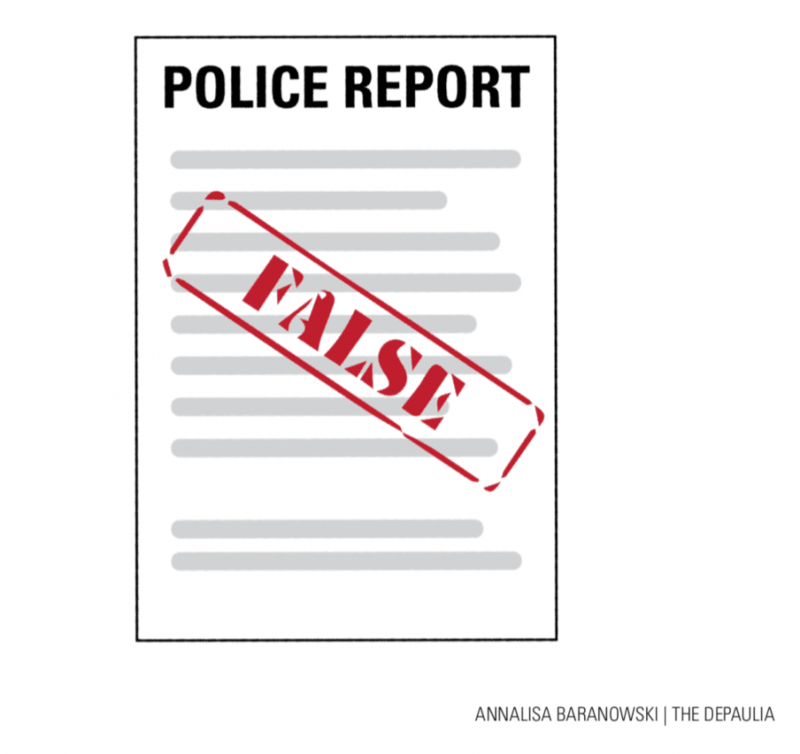 Filing a false police report can have a myriad of consequences, depending on the severity of the crime and alleged intent behind the false report. A standard false police report will often result in a misdemeanor charge, according to FindLaw. DePaul officials said that while they could not discuss the specifics regarding the outcome of this case, should the university choose to take disciplinary action it will be handled by the Dean of Students if the student in question is charged.